Dr Katharine Vincent is in Cape Town this week, participating in a CDKN Knowledge Accelerator lab with the DECCMA Ghana team. The Knowledge Accelerator lab forms part of an initiative of CDKN to move "from knowledge to action" in selected African countries. 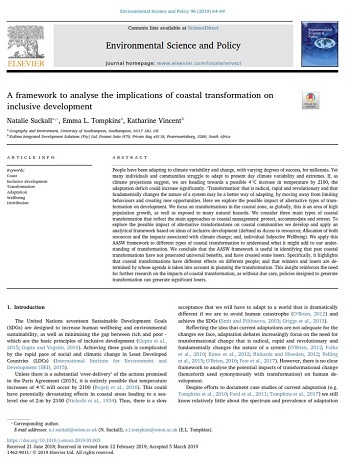 Building on findings from 4.5 years of research on climate change, migration and adaptation in the Volta delta, the DECCMA Ghana team, led by the University of Ghana, submitted a project concept under the call on empowering women and transforming gender relations in the Volta delta, Ghana. The lab will provide the opportunity to further develop the concept into a proposal that supports a transition to gender-responsive adaptation in the delta. Katharine is a member of the multi-stakeholder team, which comprises researchers, policy-makers and practitioners. 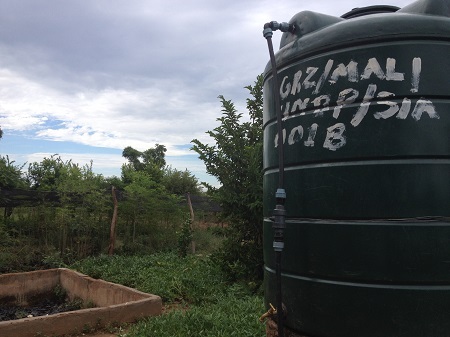 Dr Katharine Vincent is working as part of a team led by CowaterSogema to cost South Africa's National Climate Change Adaptation Strategy (which also acts as the National Adaptation Plan under the UNFCCC). The aim of the costing exercise is to highlight the business case for investment in adaptation in South Africa, for use both within national government and to seek alternative sources of adaptation finance. The strategy has a 10 year lifespan as is due to be formally adopted in 2019. The team are applying mixed methods to cost the strategic interventions, which will then be presented to a stakeholder workshop prior to finalisation. Dr Katharine Vincent is in Gaborone this week, contributing to a day of training on gender and climate change. The workshop has been organised by the Botswana National Designated Authority, with the support of the Southern Africa Climate Finance Partnership (a programme supported by DFID and the Swiss Agency for Development and Cooperation), and aims to build capacity to develop project concept notes and proposals that are successful in receiving resources from the Green Climate Fund. Katharine will be outlining the Green Climate Fund's Gender Policy and Action Plan, and running interactive exercises to enable participants to identify opportunities to make climate change projects gender-responsive. 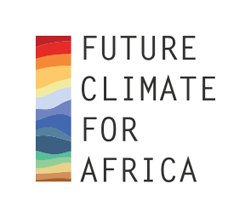 The Future Climate For Africa website features three blogs from the UMFULA project with inputs from Kulima. 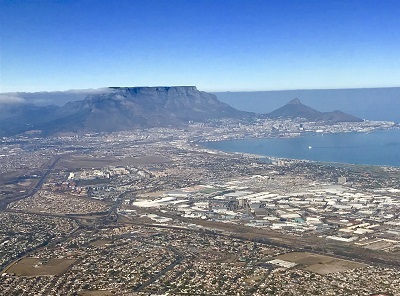 In "Lessons I took away from my first Adaptation Futures Conference" Dorothy Tembo-Nhlema reflects on what she learned at the meeting in Cape Town and its relevance for Malawi. 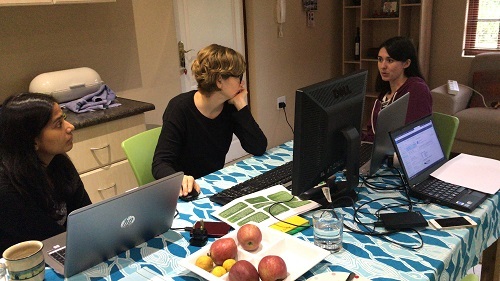 In "Writeshops – key tools for generating outputs in international research projects" Joanna Pardoe (LSE), Katharine Vincent, Rebecka Henriksson Malinga (UKZN) and Neha Mittal (Leeds) reflect on the benefits of sitting together to work on a common output. In "What if applied research projects required a carbon budget, alongside a financial one?" Katharine Vincent considers one way of limiting carbon emissions in international projects. Dr Katharine Vincent and Dorothy Tembo-Nhlema are representing Kulima this week at the annual meeting of the UMFULA project (part of the Future Climate For Africa programme) in Dar es Salaam. 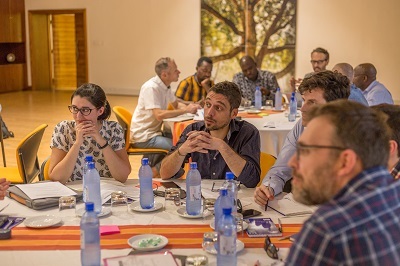 The meeting brings together the climate scientists, impact modellers and social scientists from the UK, South Africa, Malawi, Tanzania and Cameroon to feed back on research findings and, with less than a year until the end of the project, to synthesise emerging lessons. It will be followed by a range of stakeholder events, including presentations to the Tanzania Meteorological Agency and TANESCO (electricity company), and a student session at the University of Dar es Salaam. 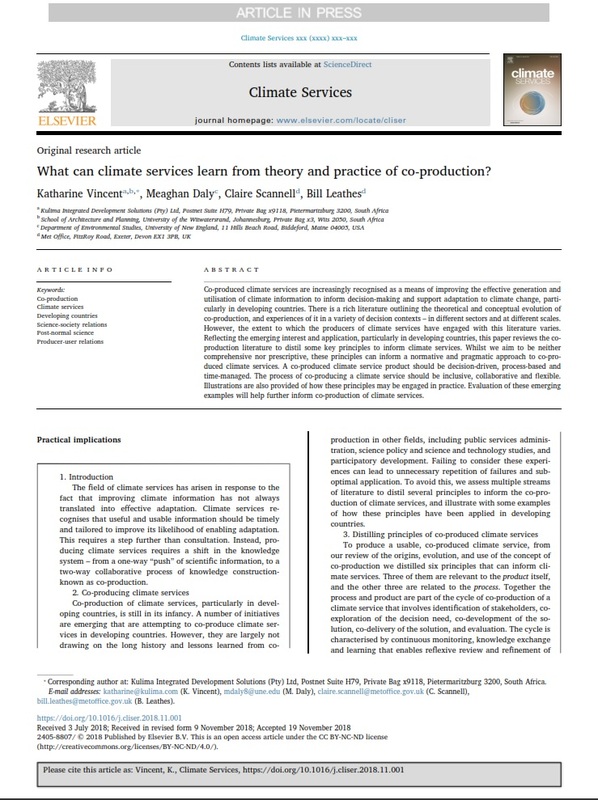 Dr Katharine Vincent is part of a project team led by Urban Earth which is working on an assignment as part of GIZ's Provincial Climate Change Support Programme. 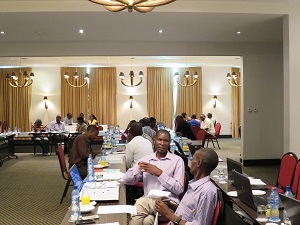 The aim is to support the development of adaptation project proposals from six of South Africa's provinces. 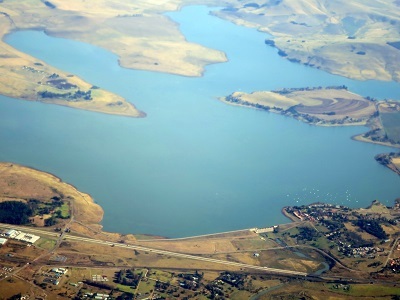 Kwazulu Natal, Mpumulanga, Limpopo, Gauteng, Northwest and the Northern Cape have all identified priority projects out of their provincial adaptation strategies that are related to water and climate change. Kulima's role is input to the development of financial proposals based on appropriate adaptation finance sources. 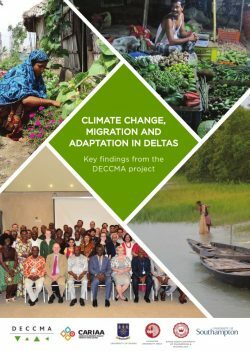 As it nears the end of its 4.5 year lifespan, the Deltas, Vulnerability and Climate Change: Migration and Adaptation (DECCMA) project has released a summary of its key findings on climate change, migration and adaptation. Deltas are home to 500 million people worldwide and play a key role in the economies of countries. Climate change exacerbates environmental change due to sea level rise, salinisation, flooding and coastal erosion, and different levels of social vulnerability create different risk profiles (including for men and women). Migration has long been evident in deltas (primarily from rural areas to urban areas) but environmental change alters the context in which migration decisions are taken, particularly when environmental factors reduce the ability to earn a living. As mobile environments, adaptation has always occurred, but more is likely to be required in the future. The publication also outlines some of DECCMA policy impacts building achievements. Kulima's role in DECCMA has been to ensure integration of gender, champion research impact activities, and contribute to adaptation research.